did you know that the house that fried chicken built has a bakery? it's a pretty good one, too. it's called max's corner bakery and you can find it...in the corner of max's restaurants. HA. some of them anyway. 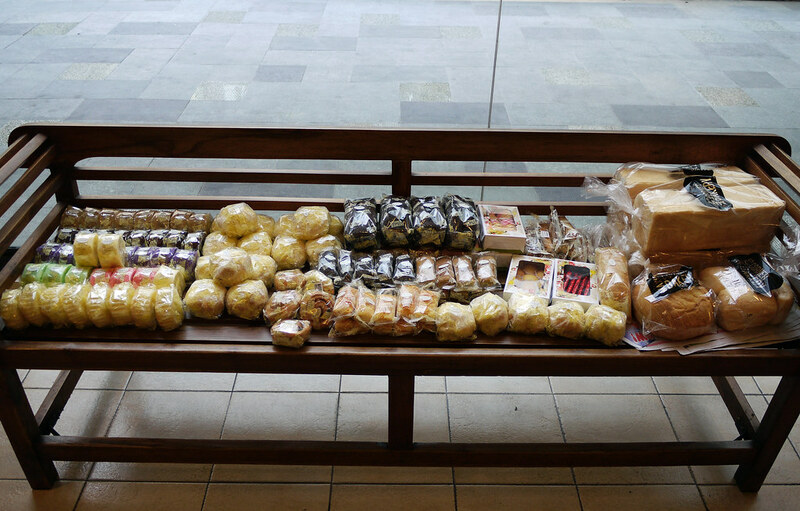 i was walking by the one near my flat early one morning, and came across this lovely tableau of assorted pastries, waiting to be arranged on their tidy shelves. i rather like where they are. because you had a hot day. 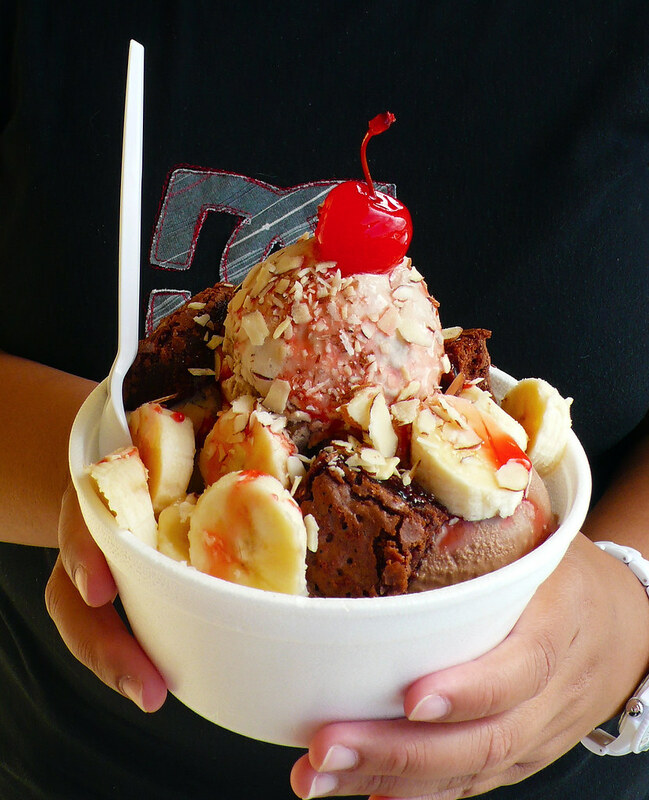 taotaomona sundae: three scoops of ice cream, bananas, brownie chunks, nuts, strawberry sauce, and a cherry on top. at mount lam lam sno' n' ice cream. men and their meats! lunch at churrasco. whoo, carne! 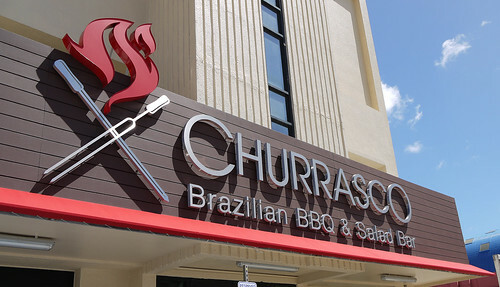 although i had not been a previous fan of brazilian barbecue-style restaurants, i gotta say, the owners of churrasco brazilian bbq and salad bar in tumon are totally canny for bringing the rodízio-style all-you-can-eat meat festival to guam. and even more genius for keeping the prices relatively reasonable, and hopefully keeping the quality high. 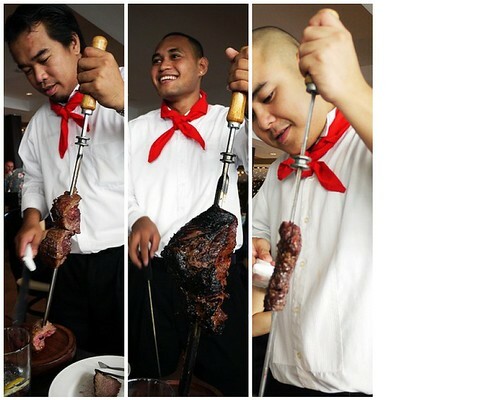 churrasco opened last month in the former mac and marti's space in pacific bay hotel. 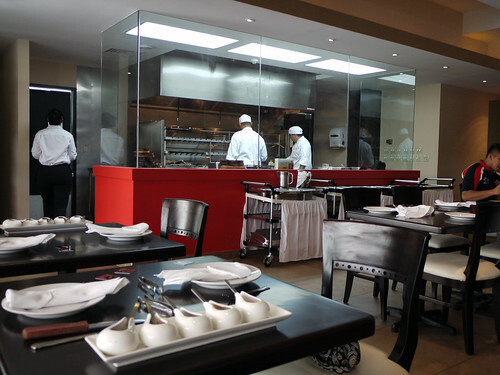 it is a light-filled dining room with a glass-enclosed wine room at the entrance, a sleek bar behind it, outdoor seating in the hotel's courtyard, and a glass-enclosed grilling area at the back. the restaurant does not take reservations, but the dining room is large, and despite the enormous salad bar off to one side, they manage to create walkable aisles so you don't go bumping into everyone on your way to and fro. the basic set up: you get your salads from the nicely varied salad bar at your leisure. at lunchtime, there is a hot food station with various starches--rice, red rice, and mashed potato, along with black beans and steamed or sauteed vegetables. at dinnertime, this is replaced with a cheese and bread board, along with smoked salmon and typical accoutrements, with the starches, beans, and veggies served at your table. at your table, you'll find a little plastic chip that says "yes" on one side, "no" on the other. flip to "yes", it means the roaming gaucho-esque servers with swords of grilled meats will stop at your table, then carve and/or serve whatever they have on offer; "no" technically means you're not ready for more, but the genial servers will sometimes stop anyway (just in case you don't really mean it). 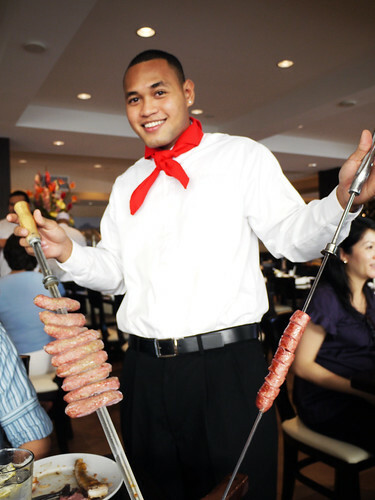 brazilian barbecue is usually just salt rubbed cuts of beef or pork, grilled on an open fire--the flavour comes from the cut of meat and can be enhanced with various sauces. at lunch we were offered mostly beef cuts--i don't remember them all but do recall picanha, or rump cover steak (part of the top sirloin cut), brisket, and tenderloin. the picanha has a strong, marked flavour--think less beef, more cow. the salt coating was quite noticeable and none of the cuts were particularly tender; however, when we returned for dinner a few weeks' later, the salt coating was more moderate and the meat noticeably tender. i appreciated the fact that most of the cuts were medium rare to rare once carved; however, if you prefer well-done meat, they will bring well-done carvings from the kitchen. we were also offered pork ribs (meaty, tender but still resilient), two types of pork sausage--one smoked, one cured--and two types of pork loin--one that may have been basted in barbecue sauce, and the other encrusted in parmesan cheese. the sausages were lovely, rustic and juicy, but both pork loins were tough and stringy each time we dined there. the surprise hits for us were the chicken offerings--marinated bone-in chicken thighs with crispy skin, and bacon-wrapped boneless pieces. both were moist, tender, and actually tasted of chicken. unfortunately, churrasco does not have any regular seafood offerings (although i heard there were lobster tails on mother's day), but we had a surprisingly tasty grilled pineapple at dinner. 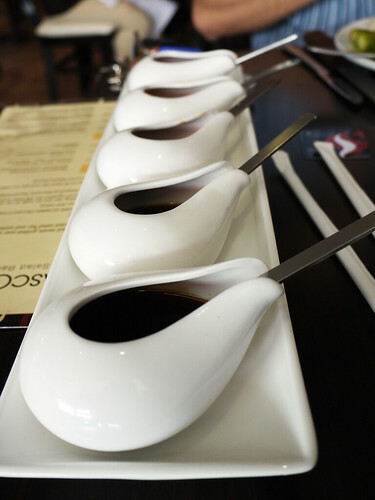 churrasco has five sauces: a thin vinegar based barbecue sauce, two kinds of finadene (regular and a reduction), red wine vinegar, and a chimichurri-type sauce. the chimichurri here is different from the one i am normally accustomed, which is a green sauce made with garlic, parsley, vinegar and olive oil. this one is red, possibly from finely minced red bell peppers, along with garlic, vinegar and olive oil. none of the sauces are particularly spicy, but they do pack quite a bit of flavour nonetheless. the serving containers are cute as all get out, but the ultra-stylish spoons are a little unwieldy; it's easier just to take them out and pour it directly from the palm-sized flask. i personally did not find a need for the sauces, but i appreciated that they enhanced the flavour of the meat instead of masking it. the starches available were somewhat disappointing; although the red rice was good, the white rice was surprisingly overcooked and mushy. i like the mash potato, which seems to be nothing more than potato, mashed--i didn't detect much seasoning. the fried yucca offered at dinner weren't particularly crispy and i suspect weren't actually yucca, but sweet potato (these were too orange and mushy). 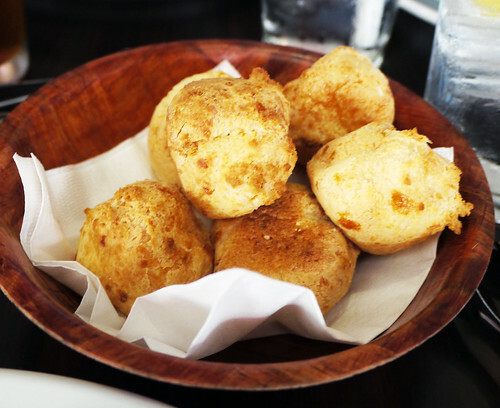 the nicest carb on offer are the small pao de queijo, or gougères. think cheese-topped cream puffs without a filling. i do want to note that one of the things i dislike about most brazilian barbecue places is the saltiness of the food--not just the grilled meats but also all the sides. luckily at churrasco, they have a light hand with the seasoning of all the side dishes, and the barbecues are the least salty of any i've tried. 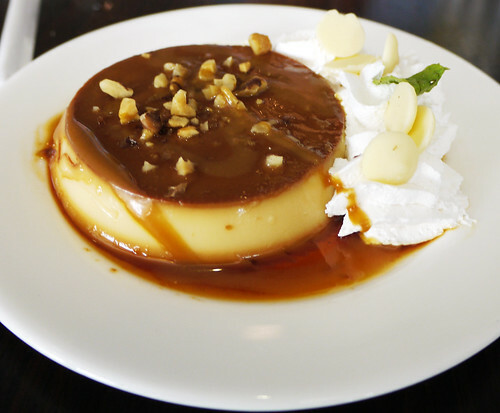 we capped our lunch with a small pudim de leite condensado, or brazilian-style flan. it was firm and very, very rich--muy condensado, lol--so much so that the whipped cream, caramel, and white chocolate chips actually cut through the milky fattiness. eep. i like this place. the prices are reasonable--$19.99 for lunch, $33.75 for dinner--and the quality of food and service are high. it's a good place for a celebration, or to take out-of-town guests, but probably not so good for vegetarians or pescatarians. 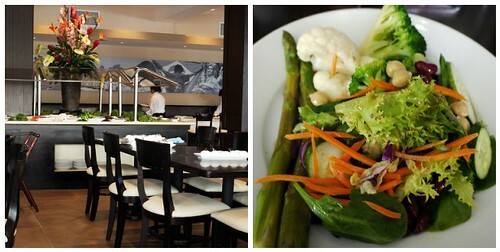 (however, the salad bar is fresh and abundant, and there is a bar tapas menu that has a couple seafood offerings.) i've only dined there twice, but there was marked improvement between visits. i will definitely return to see how they continue to fare. that white bldg with the flower shop and chinese restaurant. 1000 san vitores road, tumon.